Open inguinal hernia repair is one of the most common surgical procedures performed. 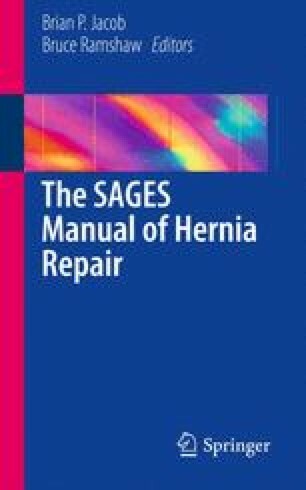 Laparoscopic repair of inguinal hernia gives excellent results when performed by surgeons expert in the technique and is estimated to make up between 15 and 30% of inguinal hernia repairs in the USA. We believe, however, a good herniologist should have multiple options to offer his/her patients. Most hernia repair methods, both open and laparoscopic, have literature supporting a very low recurrence rate when using mesh. The majority of data does show that the laparoscopic repair leads to less acute pain and quicker recovery, but most importantly, when done correctly, the risk of chronic pain is lower for the laparoscopic repair. Most patients referred for repair are symptomatic, and we advocate fixing all symptomatic inguinal hernias if the patient can tolerate surgery. If the patient is asymptomatic, then we will discuss watchful waiting realizing that many will eventually become symptomatic.